Staying well in the summer heat | MAX Solutions. Climate change is leading to longer, hotter and more intense heatwaves in Australia1. Heatwaves cause more deaths across the country than any other extreme weather events. The Australian Bureau of Meteorology2 defines heatwaves as three or more days of unusually high maximum and minimum temperatures in any area. Even when we aren’t experiencing a heat wave, hot weather impacts your health and wellbeing3. High temperatures can affect your ability to concentrate, your strength and alertness. Hot weather causes tiredness, impaired effectiveness and predisposes people to accidents. People’s work capacity declines when temperatures climb above approximately 26°C. In the last 50 years, hot days have doubled in Australia4. When the temperature around your body is greater than your core body temperature (your core body temperature should remain between 36.1⁰C – 37.8⁰C), sweat production is the chief way your body cools down5. Some people, usually the elderly, those with chronic illness or those who take medications (such as diuretics and anticholinergic drugs) may be less able to reduce their body temperature in this way. Under some conditions, sweating isn’t enough and your body temperature can rise rapidly6. This is more likely to happen when it is humid, or when you’re dehydrated and cannot produce enough sweat. Some people cannot cope as well with hot conditions as others. 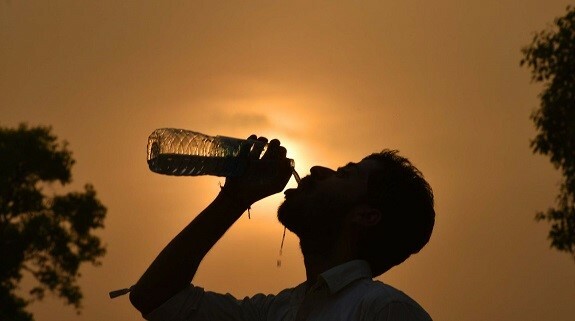 Exposure to high temperatures can make existing illnesses seriously worse, cause serious permanent injuries (damage to the brain or other vital organs) as a result of untreated heat stroke, and in extreme cases can result in death. Signs of heat-related illness in an individual often begin with heat exhaustion, which, if left untreated, might progress to heatstroke. Heatstroke is clinically defined as a core body temperature of at least 40·6°C5. Progression to death in an individual with heatstroke can happen rapidly (within hours), and even with prompt medical care, 15% of heatstroke cases are fatal5. Seek medical aid if the patient vomits or does not recover quickly. How can you stay well in hot weather6? If you are taking medicines that can potentially impede heat loss, consult your doctor about how to monitor yourself (eg, regular bodyweight measurements to monitor hydration status). Watch those around you, make sure there is always plenty of water to drink and if you are unsure, consult your doctor.